So everyone and anyone who knows me will know that I am obsessed by Lush, I actually have become so obsessed I’m thinking a career change could be in order for me just so I can spend the day there and get discount haha! 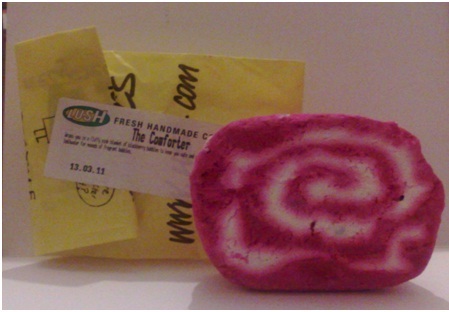 This gorgeous raspberry smelling bubble bar does what it says it does, it comforts! It creates a bath full of warming bubbles and leaves you soft and scented, the water turns a lovely bright pink colour too. Even though Lush recommend that you can make 2 baths out of this I make at least 6 and as you can see from the picture below there are plenty of bubbles and a good colouring of the water from that, I think using half of this bad boy for one bath would just be far too much.